Attorney General Jeff Sessions has directed border officers to reject migrants’ asylum requests at the initial “credible fear” stage whenever migrants claim to fear non-political gang crime or spousal abuse, according to a CNN report. The asylum reform comes as tens of thousands of migrants try each month to join the roughly 500,000 Central Americans who have already flowed into U.S. blue-collar jobs, public schools, and working-class neighborhoods since 2009 because of migration-friendly rules set by former President Barack Obama and his elite-left aides. The new rules also counter the migration-friendly judges who are forcing border officials to release migrants who bring children with them in just 20 days. The reform raises the bar in the initial credible-fear interviews conducted by border officers. Under Obama’s rules, roughly 80 percent of migrants got through this stage, often just by saying they fear persecution by criminal gangs and violent spouses. Once past this “credible fear” stage, migrants can use a single child to exploit many legal loopholes and courtroom appeals which trigger the “catch and release” rules that have allowed at least 400,000 pending asylum-seekers to get work permits in 2017. Sessions’ higher bar at the credible-fear stage allows officers to immediately send migrants and children home, or back over the border, without allowing them to begin filing for asylum. The reforms will apply to parents who bring children with them to the gates at the border, and will work alongside the zero-tolerance policies being applied to migrants who cross the border illegally. 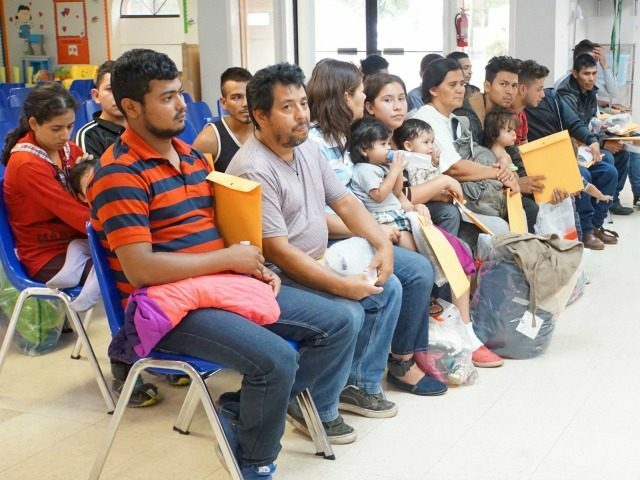 The new guidance from US Citizenship and Immigration Services … instruct[s] the officers who conduct the initial interviews at the border to reject asylum claims based on those [crime and spousal abuse] fears. Beyond that, the officers are told to evaluate whether an illegal border crossing should also be grounds for rejection, as Sessions had also argued. The rules still allow migrants to immediately appeal their claim to an immigration judge, but the process is complex. Also, the immigration judges work for Sessions, and they will also implement his new directive. Immigration lawyers oppose the Sessions reforms, which will likely reduce the number of cases for immigration lawyers. Sessions can set the new policies because he is in charge of the immigration courts and write the rules. For more than a year, he has been rewriting the Obama-era regulations step-by-step, even as he also fight many lawsuits launched by pro-migration groups. Sessions is preserving the traditional asylum rules, ensuring protection for people who are being persecuted for their religion or politics or membership in a particular social group.